GuthrieAmerica: Jacquelyn & Jaylen — Go Win with Heady! Smiles all over the place. 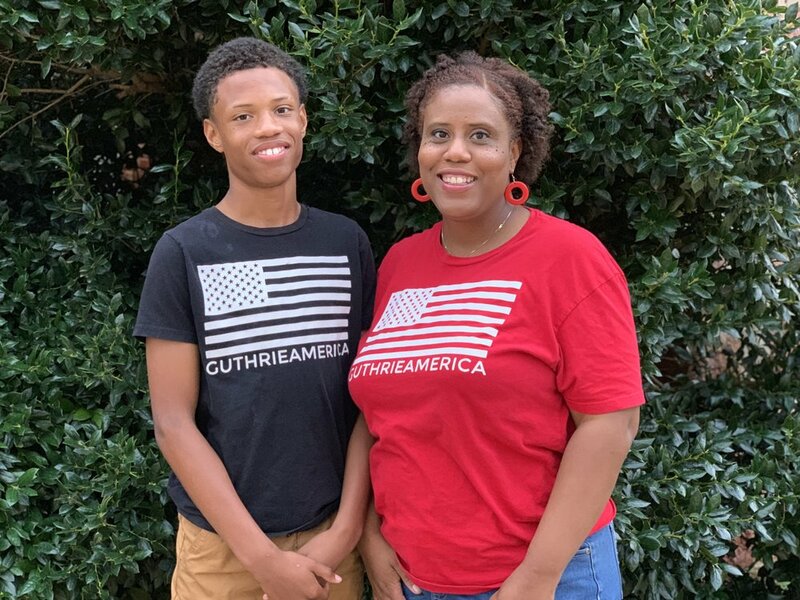 The first mother and son GuthrieAmerica interview. Excited to share. Jacquelyn - I was born and raised in Albuquerque, NM on June 16, 1977 to the parents of Glen and Lorraine Chelf. Resided there until I was 18 and came to Oklahoma to attend Langston University. Jaylen - I was born in Edmond, OK at the Renissance Women's Hospital on November 5, 2004. My parents are Jacquelyn Chelf and Harold "Poppy" Fields. Jacquelyn - I moved to Guthrie in 2000. It was my last semester at Langston University, with my oldest son JaRon. The plan was to stay only one year after I graduated, then move back home to New Mexico. One year turned into two years, two years have turned into 18 years and in that time span Jaylen was added to the mix. Guthrie grabbed a hold of us and never let us go. We have been blessed. Guthrie is where my children call home. Jaylen - Hmm, let me see. I moved to Guthrie 2 days after I was brought into this world. I had two homes for a long time. I would spend my summers in New Mexico with my grandparents and Guthrie through the year until I became real active in sports. Now, it is just Guthrie. This is home. Jacquelyn - One of my favorite Guthrie memories is being in college and coming to my first 89er Day Celebration. It was so many people, everybody was driving up and down the streets. There were cars parked and cruising through Mineral Wells Park. When we went driving through the neighborhoods people were inviting my friends and I to come to their cook outs liked they had known us all their life. This was before I had children and it is still a eventful day/week, just not the same as that year. Jaylen - Going to Guthrie football games when I was a little boy and wanting to be a Guthrie Bluejay. Jacquelyn - Everybody knows everybody and they know I am a single parent so they help keep an eye on my children. People know they are mine and will call or find a way to let me know my boys whereabouts. Making me feel safe and less worried about my children. It has been a good place to raise my boys. Jaylen - Now that I'm 13 years old and my mom lets me walk downtown and hang out with my friends and go to Rick's Coffee.That’s my favorite thing. Before that I just liked living here and playing sports with people I go to school with and going to church and participate in the youth group. Jacquelyn - Missy's Donut Shop!!! Guthrie Homecomings are completely different from where I grew up. Its is a community affair that makes you feel part of the town. Jacquelyn - I am not. I am a West Mesa Mustang! Go Mustangs! Jaylen - I am currently in the 8th grade at Guthrie Junior High. I plan to graduate in 2023. My older brother is a GHS alumni. Have never moved since 2000. Jacquelyn - Mercy Clinic, Guthrie on South Division for 5 years. Jacquelyn - Working where I work, I am able to meet people and connect with people when they are going through hard times. Jacquelyn - Didn't grow up in Guthrie, but when I was living in Coyle, OK I worked at the Old Dollar General store that was located downtown while I was going to school. I didn't get fired, just graduated from college and started a new job. Jaylen - I wish my mom would fire me from doing chores. She is always correcting me to do them better. Jacquelyn - I have my two sons, JaRon and Jaylen and I my Goddaugther is like my other child, Danielle. There are families that have adopted us and treat us like blood. We are so Thankful God has blessed us with Our Villages, from the Shelia Jones, The Colemans, Ms. Joann Washington and Andrea Bennett, The Foster's, Tori Trice, My church family at Mt. Zion, my Soccer Family, Football Family, my list could go on. This community has become MY Family. Jaylen - My mom and brother JaRon. I have other Big brothers such as Chase, Jeremiah, Brendon, Chris Ja'lyn and Ashon they beat up on and protected all at the same time have picked me up from school if my brother couldn't, have come to my games, have worked out with me. My best friends are like my brothers to me too. Jacquelyn - I seen it first hand from the creator of the brand. I was instantly hooked. I was like yes! This is GuthrieAmerica where people Do Life together. Jacquelyn - Because it connects people and it represents our town. When you wear the tee you have a sense of pride of what town you represent and what country you live in. It inspires you to Do Life with people you may not know and represent in places I may go. Jaylen - It is Fly! And I’m from GuthrieAmerica. It represents HOME. Jacquelyn - Going to my church at Mt. Zion and football games on Friday nights. Jaylen - Playing sports, hanging out with my friends, going to Missy's, going to Rick's Coffee, going to football and basketball games, going to play basketball with my big brother at Mineral Wells park to name a few. Jacquelyn - Community Wins means to me that families, churches, schools and businesses win because we are all doing life together supporting one another. Jacquelyn - My momma in Heaven and My Daddy in New Mexico, sons, god-daughter, my sisters/brothers, blood and not blood. My whole squad of nieces/nephews. To my animal tamer Nia who is not my niece by blood but that’s what she is to me! Jeny Crick and her crew, Joyce Leach and her crew, Terry Bennett and Ed Stevenson and all the teachers and coaches they have played a great roll in our lives. Shout out To Guthrie!!! And Hammons and Murillo’s. And the Dightmans. And Mikki. Jaylen - To my boys Zale, Isaiah, Willy, Tayton. My mom and daddy, my brothers, and my sisters and my little niece who lives in Texas. Jacquelyn - CHOOSE GUTHRIE means support our churches, schools, and businesses. Support events and functions. Help one another in order to continue to build a strong community. Jaylen - To choose to Do Life with people here.